Angus is acknowledged as one of the key centres of Pictish life in the first millenium, thanks to the relative wealth of archaeological evidence found locally. In particular, a large number of Pictish stones have been found in Angus which are famed for the remarkable quality of their carvings. 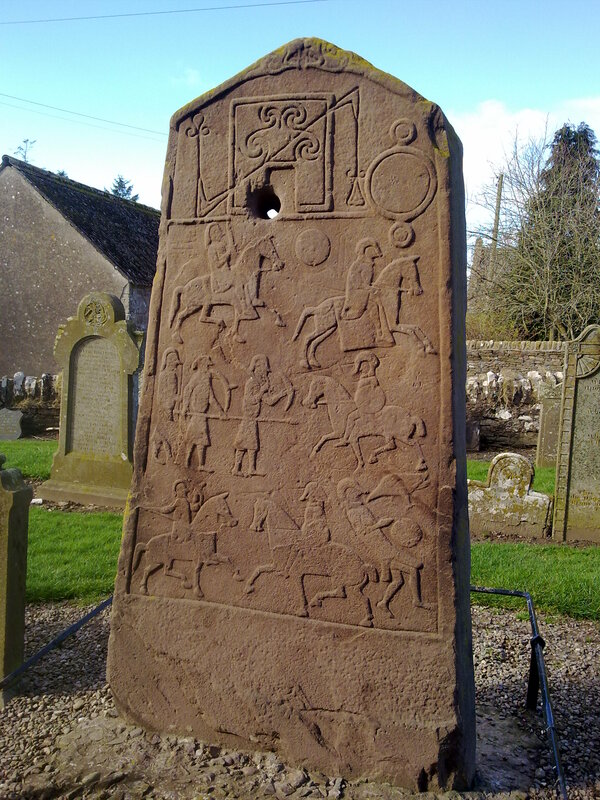 Meigle and St Vigeans are both home to important collections of Pictish stones, while a cross slab from the village of Aberlemno is considered one of the finest early medieval stone carvings in Europe. It is also widely believed that the Battle of Dunnichen took place on and around Dunnichen Hill, just outside the Angus village of Letham. This battle is one of the most important dates in Scottish history, as the Pictish victory finally halted Northumbrian expansion in Scotland and created the foundations for Scotland as we know it to eventually form. The Angus Pictish Trail Guide provides an informative guide to many of the key Pictish sites in Angus. This leaflet can be downloaded here: Pictish Trail Leaflet. In Aberlemno, there are three roadside stones, two of which bear symbols only, the better one with fine snake, double-disc and z-rod, mirror and comb symbols. 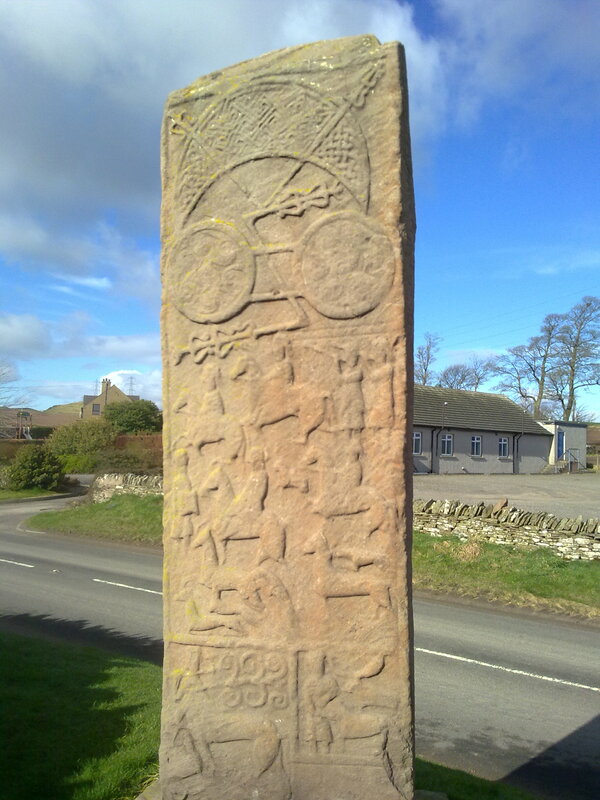 The third stone is a Pictish cross slab with a ring cross on the front and a particularly good hunting scene on the back. 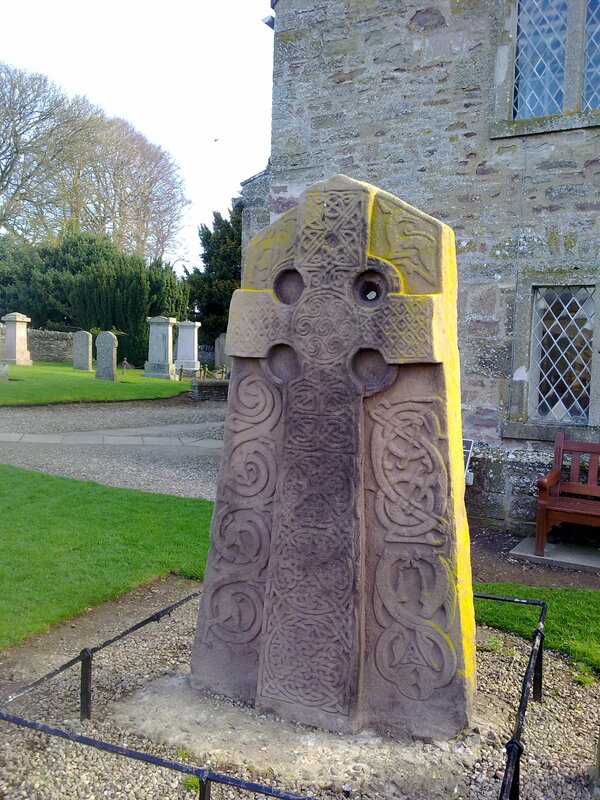 The cross-slab in the Kirkyard, one of the finest Dark Age sculptures in Europe, stands on the west side of the church. The front has an impressive cross and the beautiful decoration is heavily inspired by Northumbrian art of the late 7th/early 8th centuries. The reverse has a magnificent battle scene which is thought to portray the battle of Dun Nechtan or Nectansmere of 685 AD when Brude MacBeli defeated the Northumbrian King Ecgfrith and his army. 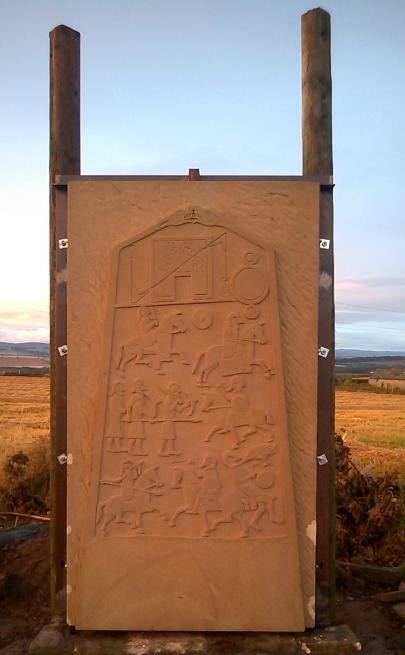 The slab ably depicts Pictish and Northumbrian cavalry, Pictish infantry and a dying Northumbrian being pecked by a Raven. The story in the stone depicts Egfrith, King of Northumbria, who arrogantly led an army to stamp his authority on the province of the Picts. It's said the Picts feigned retreat and lured the King into narrow mountain passes where he was killed with the greater part of his forces. Almost all the English army were killed and the remnants forced to flee from Pictish territory. The nuances of the carvings provide a more intimate detail of the fate of Egfrith and his men...............for more details on the stone please visit Historic Scotland. When Pictavia sadly closed its doors for the last time in October 2014, it became apparent there was no home for the replica stones. To save the stones being scatted to the four winds, Aberlemno community contacted Angus Council to offer a new home for the stones. We have now installed the replica battle stone in the car park of the village hall. The good news is the stone will be uncovered all year round so that visitors to the stones can still see a full size replica of a stone after the real stones have been covered up for winter. The rear of the hall is currently being refitted to accommodate Pictish interpretation boards etc. along with more replica stones and stone carvings which have been kindly provided by sculptor Andrew McFetters.